Back in 1997, Mercedes-Benz showed off the F 300 Life Jet. Like most concepts it was an impractical flight of fancy fueled by weak German pilsner and strong German coffee. But 16 years later, the Life Jet inspired the suspension wonks in charge of the new S-Class Coupe, and now the luxo-sled leans into corners. 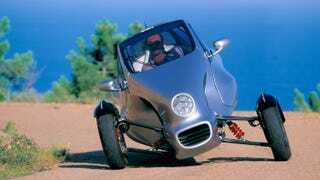 The idea behind the three-wheeled Life Jet was to combine the handling of a motorcycle and the comfort of a car. Naturally, it failed on both fronts. But the core technology – Active Tilt Control – actually worked. With the onboard computers taking in speed, yaw, steering angle, and acceleration data, the Life Jet would bend into a corner as much as 30 degrees. Four years later, Mercedes brought out the F 400 Carving, which evolved the suspension tech even further. Because they added a fourth wheel, the angle were reduced to a maximum of 20 degrees, but the additional rubber meant grip was improved. For the S-Class Coupe, Mercedes has taken its existing Active Body Control (ABC) and modified with a new "curve tilting function". Depending on the radius and angle of the bend, plungers at the bottom of the struts raise one side of the car while lowering the other to make the Coupe lean into a corner. But it's not just accelerometers, throttle, steering, and brake inputs that affect the angle. The stereo camera mounted in the windshield (normally used as part of the adaptive cruise control) will see the curve ahead – up to 50 feet – and channel that info into the system to get the attack just right. The result is a big coupe that has body roll in the opposite direction. Yes, that's not going to do much for cornering speeds – which Mercedes readily admits – but makes for a more fluid driving experience on back roads. Frippery? Sure. But it's better than headlights with 47 crystals.